Our standard redwood greenhouse kits use the finest twin-wall polycarbonate coverings available, ensuring years of service and weather resistance while maintaining 95% light transmission. Our heavy-duty “Insalume” frames are a durable solution with unparalleled insulation, making our Montecito aluminum greenhouses perfect for almost any climate. Our deluxe model polycarbonate greenhouse kits come standard with tempered glass sides and fiberglass roofs, with the option to upgrade to double-polycarbonate roofs or all polycarbonate, for unmatched durability, beauty, and insulation. At Santa Barbara Greenhouses, we believe that quality speaks for itself. That’s why we’ve been creating superior quality, individually made greenhouses for more than 44 years, concentrating on creating a unique and effective greenhouse for every customer we serve. We believe every home gardener deserves to experience the joy of growing beautiful flowers, delicious vegetables, and healthy, thriving plants right in their backyard, and our DIY greenhouse kits are designed to help you do just that the whole year round. Whether you’re an experienced home gardener or are just getting started with your green thumb, our affordable complete greenhouse kits are designed to help you cultivate a bountiful crop of beautiful plants – right from the comfort of your own backyard. 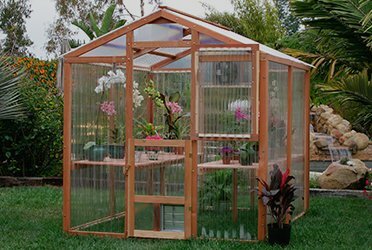 We’re proud to use clear California redwood, durable aluminum, and heavy duty fiberglass and polycarbonate in our greenhouse kits, providing a level of beauty, durability, and quality that other greenhouse makers can’t match. Plus, we include all the sorted hardware you’ll need and easy, image-filled instruction booklets with all of our kits, so assembly is a breeze. You’ll be growing gorgeous plants in no time! For nearly half a century, we’ve been providing quality greenhouses for passionate home gardeners all across the nation. Through all of that time, we believe it’s our commitment to our customers that has led us to succeed. Our mission is to ensure that every customer who purchases one of our greenhouse kits is 100% satisfied with their purchase, and we’ll take the time to talk with you about your home, environment, and gardening goals to help you select the perfect greenhouse model for your needs. 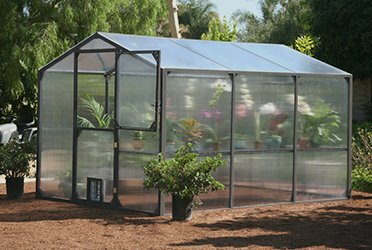 Every home is different, and that means every gardener needs a unique greenhouse to grow their best possible plants – and at Santa Barbara Greenhouses, that’s what we’re committed to providing. From the first time you call us to long after you’ve set up your greenhouse, we’ll be here to answer questions, provide support, and share the joy of home gardening with you. Build Your Own Greenhouse – Call Us Today! If you want to grow the bountiful, luxurious crops you’ve always dreamed of, there’s absolutely nothing holding you back. 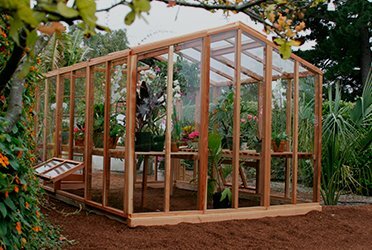 Our redwood, glass, and aluminum greenhouse kits are designed to thrive in almost any climate, and we’ll work with you to select the ideal greenhouse for your unique home environment. We love to hear from gardeners, so if you’re interested in owning your own greenhouse or just want to find out more about what we have to offer, we encourage you to give us a call at (800) 544-5276. We’ll never pressure you to buy, and we’re always happy to answer your questions. Or, if you’d like to learn more about our product offerings, go ahead and request a catalog for free – you’ll find plentiful information on the greenhouses we have to offer and how a Santa Barbara Greenhouse can help you take your gardening to the next level. We can’t wait to hear from you, and we look forward to helping you on your home gardening journey!